Breakdancing, also known as Bboying, is a type of dancing which originated in the 1970s among Latino and African-American inner-city youth in New York City. This style of dancing grew as rap and hip-hop music became more popular, and is considered an integral part of the hip-hop culture. Breakdancing has since spread around the world. 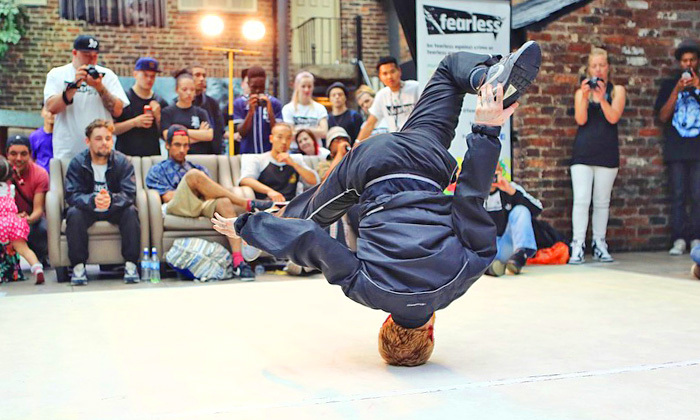 Breakdancing features four main types of movement – toprock, downrock, power moves and freezes. Toprock generally refers to foot movements performed from a standing position, while downrock relates to floor-based moves performed with the body supported on the hands and feet. Freezes involve dancers holding a certain position, and power moves feature more acrobatic elements that are often the main element of routines. Dancesport in the form of breakdancing was part of the sporting program at the Youth Olympic Games in 2018. The competition was in the battle format, in events for men, women and mixed team. The sport has also been earmarked as being included on the program for the 2024 Paris Olympic Games. Battle format is a one-on-one competition that sees athletes take it in turn to perform before being judged and scored. The winner then progresses to the next round of the knockout competition. Dancesport — the competitive form of Ballroom and Latin Dancing, in which contestants perform dances before judges. Tricking — performers combine martial arts movements with flips, kicks, twists and various dance moves to show off their tricks. Capoeira — a form of martial art from Brazil which has a combination of aspects of dance moves, acrobatics, movements and music. Sport Aerobics — the objective is to perform high-intensity gymnastic moves in sync with background music. Pole Dancing — participants perform various type of acrobatic moves like spins, climbs, twists and body inversions around a pole. Check out our Encyclopedia of Every Sport. Well not every sport, as there is a list of unusual sports, extinct sports and newly created sports. How to get on these lists? See What is a sport?